There’s a new entry on my list of favourite spots for good pub food. And it caught me unawares. When an email landed in my inbox inviting me to come check out The Talbot, a local pub that’s recently undergone a big change of culinary direction, I was intrigued. It’s not a pub I’d been to before, or really heard of, so I had a nosy about online to find out more. And, well, here’s what I found in my research: while some people were positively embracing the new menu and approach with open arms/mouths, others were up in arms at the loss of The Talbot’s previous menu. 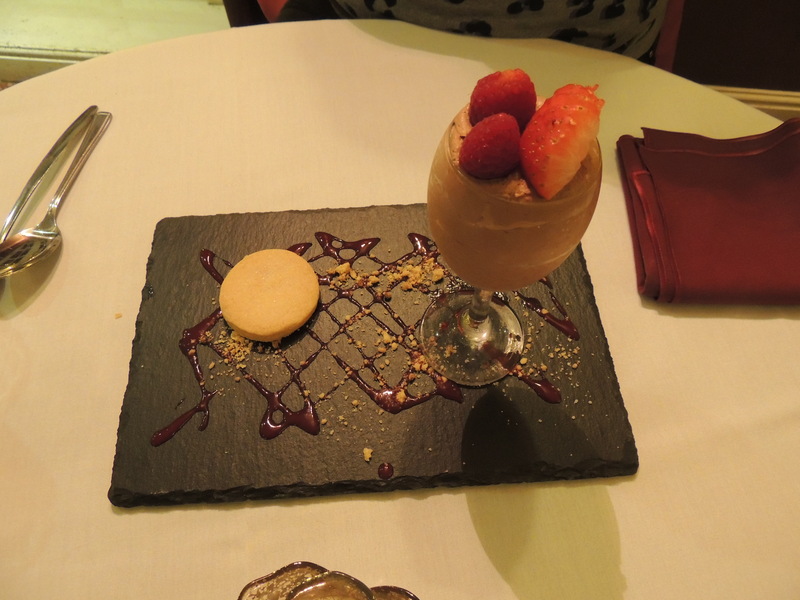 Said previous menu featured 2 courses for 2 people for £10; there used to also be 2 for £6 and 2 for £8 options. This sounds like my worst nightmare. To me, abandoning the cheap menu in favour of a greater focus on quality produce and freshly-prepared options must surely be a good move- and it certainly came across this way on the night. That’s not to say the food isn’t still affordable at The Talbot. 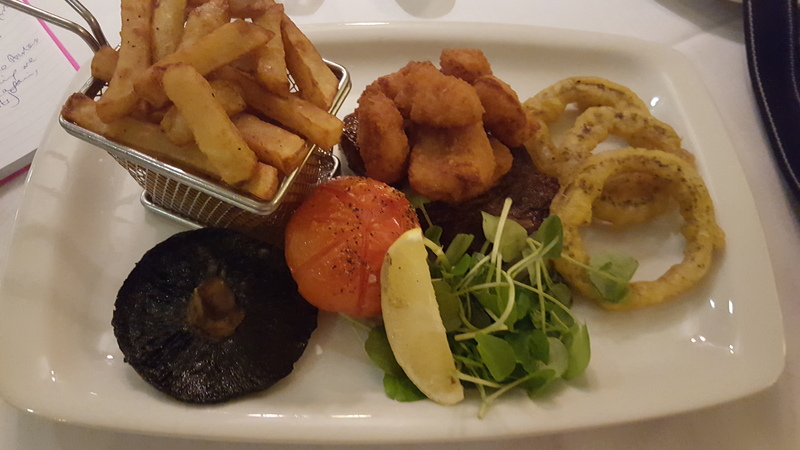 None of the starters costs more than £5, and the mains range from £5.95 for dishes like sausage and mash, fish and chips or liver and onions to £17.95 for a fillet steak. For £16.95, you can get an epic-sounding mixed grill, featuring 6 different meaty options, assorted carbs and almost guaranteed meat sweats. All very fair prices. The Talbot have moved to focus on, in their words, serving “the best food we possibly can for the best possible price, continuing in The Talbot tradition of providing good value for money. On the same hand we want to serve you fresh home cooked food”. I gather that in the olden days, there was a lot of deep frying and some microwave action, too. Nowadays, they receive daily deliveries of fresh food, from local suppliers as much as possible- meat from Derbyshire, spuds from Eckington, other veg and fruit delivered from Sheffield- and create delicious, fresh food made with care and passion. 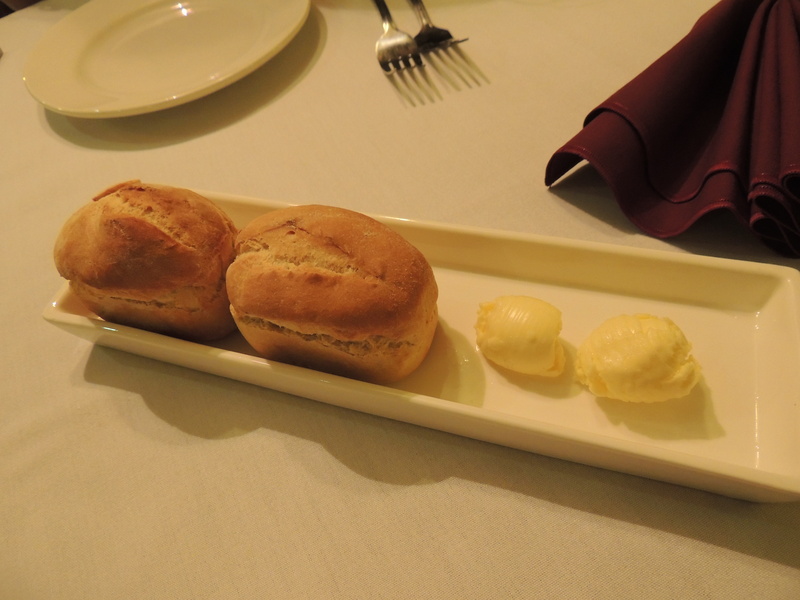 Mini loaves to nibble on. Speaking of nice touches, the proper table linen and the waiting staff being dressed professionally were appreciated by us. 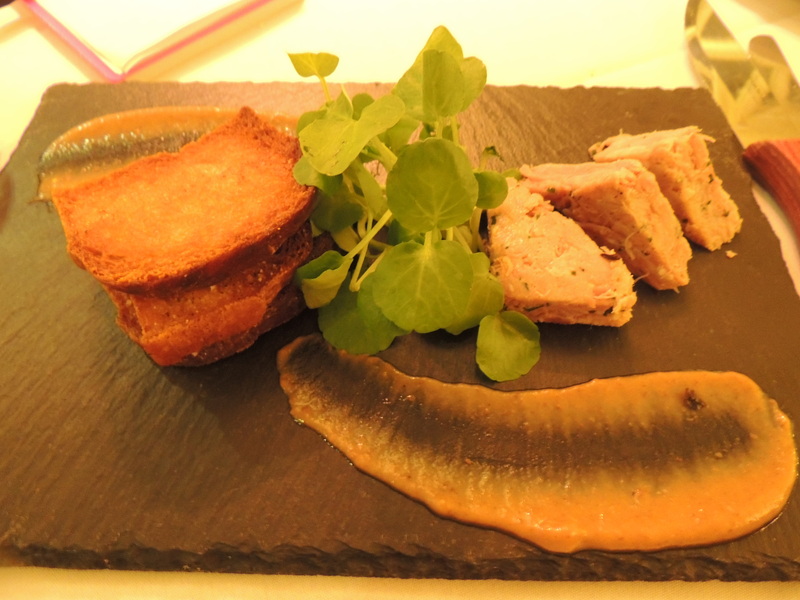 We decided to kick off with the ham hock terrine and the oak-smoked salmon fishcake, and I got to try some of both starters. As you can see, the terrine was really meaty and broke apart easily as I smooshed it onto my toast. There was a good ratio of toast:ham hock, which is always pleasing; nothing worse than being left with excess bread once the meat’s all gone (though, in this instance, the toast was so tasty with the salt and pepper on it that I would have eaten it on its own). By the end of the starters, we were already saying we wanted to come again and again to The Talbot, and that it should be added to the rotation of places we take our weekend visitors to eat. 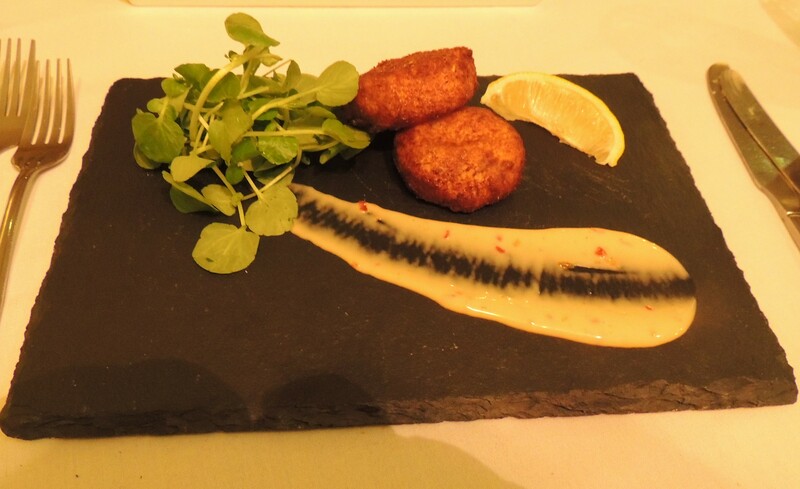 The mains arrived and I was pleased that The Talbot served them on proper plates- I’m alright with slates for starters, if they work (and they did), but I like the security of an edge/lip to my plate for a main. The “surf” element was a considerable portion of scampi. I requested mustard and was pleased to be offered a choice between English or French (French, always, with steak). The steak itself had been grilled medium, as per my specification, and was nice and tender. Those onion rings had a good bite to them, with the batter light and crispy and the onion not greasy nor slimy. The chips were amazing. In Montréal (my childhood hometown), there’s a small chain of restaurants called Lafleur, whose fries are legendary in my family; The Talbot’s chips came very close to being cooked like Lafleur’s, which isn’t an accolade I throw around lightly, nor often. Our only criticism of the pie is that the pastry lid was a bit too thick and hard in some places. Glyn, who manages The Talbot, knew this though and told us that they’re working on it. 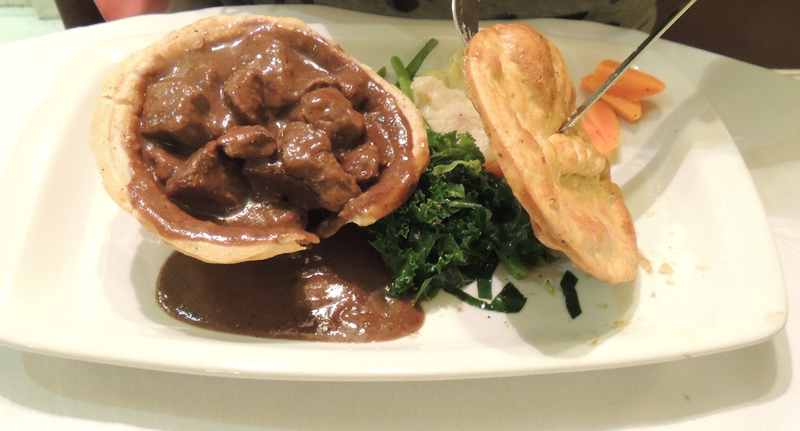 It’s to do with it being a proper pie rather than just a top-only pie, and the fact that they have to make the pies in advance so that punters aren’t sat waiting for 45-plus minutes if they order one. I’m sure they’ll have perfected it by our next visit. 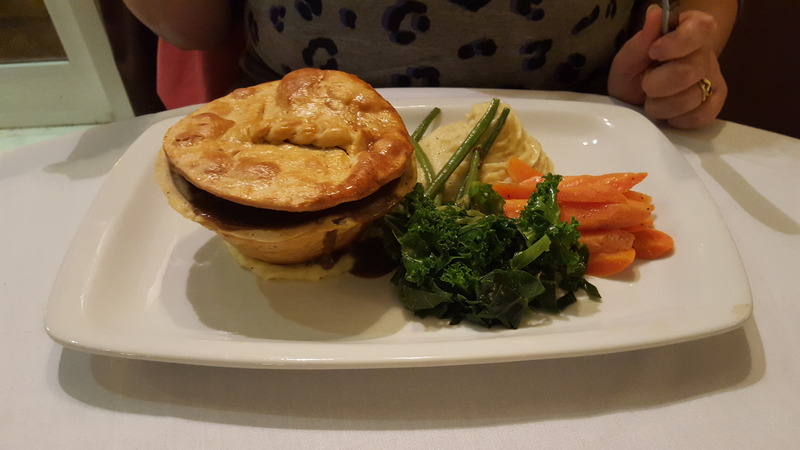 Still, the pie was brilliant and packed with flavour, as were the accompaniments- creamy and buttery mashed potato and vegetables that still had some crunch. Although we were clearly far too full to do anything but go home and lie out while contentedly rubbing our tummies, Glyn twisted our arms and- whaddya know?- desserts were in front of us before we knew it. Me: FFS, WHY did I stuff that all down? I’m soooo full! Me: Because it’s so damn tasty, Sara! The Talbot (sometimes referred to as The Talbot Arms) is located on Stubley Lane in Dronfield and is just 8 minutes’ drive from my home in S8. There’s plenty of free parking at the pub. The #43 bus from Sheffield also passes right by the pub with a stop outside, which I’ll remember next time so I can enjoy some of their boozy offerings. I also look forward to trying the hunter’s chicken and the gammon & egg, both of which Glyn speaks very highly of. Outside, there’s a big garden area with seating; apparently the front garden gets the sun all day. There’s also a fun-looking climbing frame. For kids, obvs, not for me. Dogs are welcome at The Talbot, too, in the bar side of the pub (we dined in the restaurant side), where there are screens showing live sport, as well as pool tables. This is in a separate room altogether, so you needn’t worry about being disturbed by sports fans’ cheers as you dine. 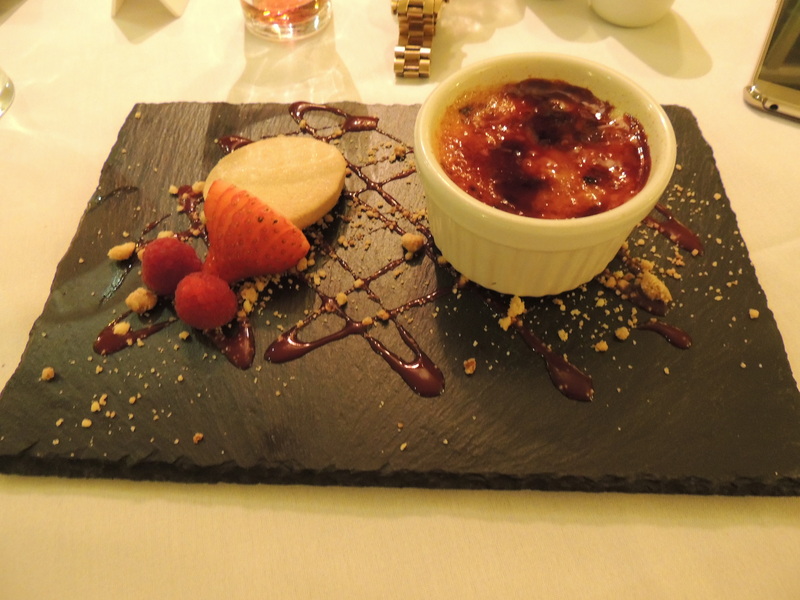 I was genuinely impressed by the food and service at The Talbot and think the change in menu and style is a smart move. The focus on quality, local ingredients ticks my boxes, and it’s good value for what you get. Thanks again to Glyn and his team for a great night; we’ll definitely be back. There’s a Virginia Woolf quote on the wall at The Talbot, which reads: “One cannot think well, love well, sleep well, if one has not dined well”. One slept very well indeed that night.